2017 In A Sentence: A fantastic defense kept them in a lot of games, but an anemic and error-prone offense saw Garrett’s first Leopard team limp to a 3-8 record, though all those wins were in Patriot League play. Biggest Shoes to Fill: LB Brandon Bryant was a monster inside for the Leopards, notching 133 tackles and 7 1/2 tackles for loss. 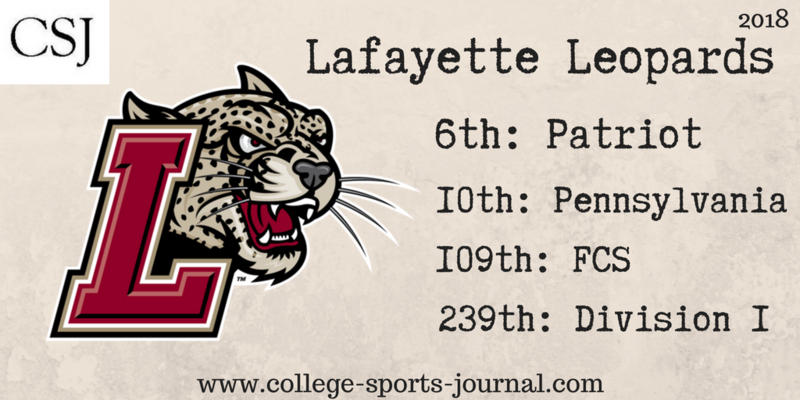 Though the entire Lafayette defense was impressive, Bryant was the centerpiece, and the Leopards will need to find another. Key Player: There is no sugarcoating that the offense needs to improve, and QB Sean O’Malley will have to be a part of that right out of the gates unless he’s challenged in preseason camp. O’Malley had some good moments last year as a true freshman, but will have to cut down on the interceptions and continue to improve in order to improve Lafayette’s record this year. Fearless Prediction: Nobody promised John Garrett a rose garden in his first year, but despite the record, the Leopards were in the thick of things in a weak Patriot League. Could it happen again? If it does, it will be because of O’Malley’s improvement and because Garrett will have found more playmakers on defense.